SongPop is a very popular game among music lovers, it is basically a pop quiz app, which is quite similar with the playing pattern of Draw Something. Even though it is different when compared with Draw Something, it does it take the turn-based structure of Draw Something game and the good part is that it uses licensed music instead of long-winded text questions. To play this game you should have the knowledge of popular music and have fast fingers. Unlike the Draw Something game application where people have the insecurities about their drawing ability, SongPop appeals to anybody who has enjoyed listening to music over the years, so why not give it a try. SongPop’s graphics and animations are extremely well-polished and colorful. Once you start the game, you will simply get amazed by the quality of the graphics. The bright explosions come when you get the victories and also sharp numbers of fade in for the countdown to a new round, and the overall UI layout is simple, straightforward and clean. So overall I would say the graphics are awesome. 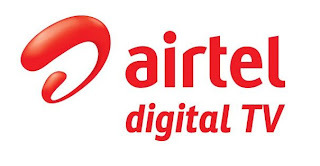 If you are playing the free version, then surely you will have to face ads in between, but if you are the premium version users then it will also includes high-quality audio playback and the ability to play with twice as many people concurrently. It is beyond the music quality, in fact the sound effects are also well-done. 1.Once you are logged in then you have to challenge another player to start the game. 2. 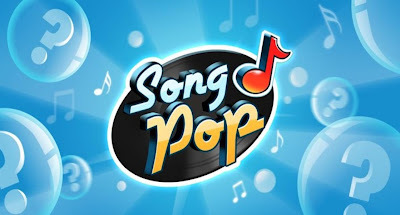 Once you choose a list of three, then a song will start playing and your task is to choose the right name of the song, or singer/s and that played song from a list of 5 songs in each game. You have to answer as quickly as you can. 3. A summary appears telling you which answers you got correct, and which were wrong and how quickly you guessed each song, so that you are updated about your status. 4. 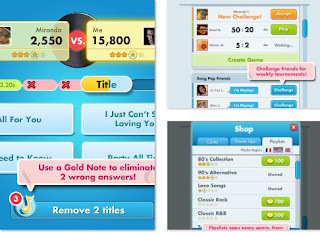 You will start receiving points for each song guessed correctly and even bonus points for guessing several songs in a row without a wrong guess, after coming into some certain level then you can send the challenge to your opponent, and then what you opponent will do it he or she will then makes their guesses and it appears in your game list when it's your turn again. 5. You will get all the updates of your challenger's answers and how quickly they guessed, displayed with your results and a tally of both players' scores. If you win then you get three coins and if you lose you still get one coin and now it is the time to play your opponent's challenge game. 6. The thing is that you begin the game with six playlists and a limited number of songs in each playlist and when you correctly guess several songs in a row you will get more songs which will be added to that playlist. More playlists can be bought with game coins that you earn by playing challenges or watching ad videos in the free version, if you can't wait to earn game coins, you can buy gamecoins with real cash. A playlist costs about 250 to 400 game coins which will run about $1.99 in real money, so it means that you do have to spend some real cash to get going really fast. 7. To keep you updated with the game overall you will be getting a weekly scoreboard which will show you a weekly count of how many games each player has won and starts over each Sunday night.